Fortison cream combines the potent topical antibacterial action of fusidic acid with the anti-inflammatory and anti-pruritic effects of hydrocortisone. 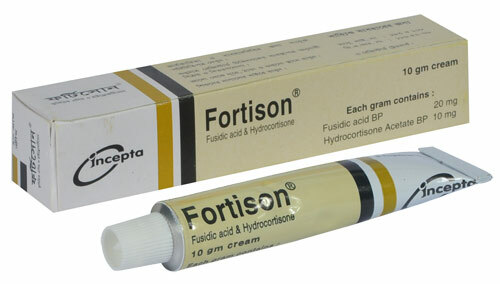 Fortison is indicated in eczema and dermatitis with secondary infections including atopic dermatitis, allergic and seborrhoeic dermatitis and primary irritant dermatitis. Hypersensitivity has rarely been encountered. As with other topical steroids, prolonged and intensive treatment may cause local atrophic changes of the skin, such as striae, thinning and dilatation of the superficial blood vessels, particularly when occlusive dressing is used or when skin folds are involved. Systemic absorption, sufficient to produce adrenal suppression, can occur with prolonged or extensive use, specially when napkin is used. Infants and children are particularly at risk. Caution should be exercised if a topical steroid is used near the eye. Glaucoma might be the result if the preparation enters the eye. Fusidic acid and Hydrocortisone should not be used in pregnancy. Both of them have been detected in the breast milk, so nursing mothers are advised not to use the drug.